What's it like to study in Iceland? The country has rather a dramatic nickname, ‘the land of fire and ice’, which refers to its impressive variety of natural features. Iceland is one of the world’s most active volcanic regions, while also having large areas covered in glaciers. A sparsely populated island nation in the north west of Europe, Iceland is also known for its hot springs, fishing industry and high quality of life. There are seven universities in Iceland, of which three are private and four public. 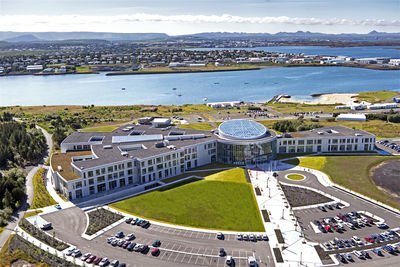 The largest are the University of Iceland and Reykjavík University, both in the capital, followed by the University of Akureyri in the northern city of Akureyri. International students make up around 5% of all students in Iceland, and universities in Iceland are generally keen to attract more international and exchange students. Many, especially the larger universities, offer a growing number of courses taught fully or partially in English, and there are good support systems in place for foreign students choosing to study in Iceland. Though admittedly not an ideal destination for those who like it hot, Iceland is not actually as cold as its name implies! In summer, temperatures in Reykjavík can reach highs of 35C (95F), and in winter the average temperature there is about 0C (32F). But while the climate in Iceland is not too extreme, the variation in daylight hours certainly is. During the middle of summer, there’s almost continuous daylight – and conversely, during mid-winter, hardly any daylight at all. As you might expect from a country characterized by volcanoes and glaciers, much of Iceland is considered uninhabitable. Most of the population lives around the coast, with Reykjavík (in the south west) by far the largest urban area. The capital offers a good selection of cultural attractions, including theaters, galleries, restaurants, cafes, bars and music venues, and more than holds its own among other European cities. Outside of the Reykjavík region, life is likely to be considerably quieter. Even Akureyri, the second largest urban area, had a population of less than 20,000 at the last count. However, that’s not to say there aren't plenty of things to do in Iceland wherever you’re based, especially if you enjoy being outdoors! Popular pursuits include whale watching, glacier trekking, snowmobiling, diving, horse-riding and fishing – and Iceland is also one of the best countries from which to view the spectacular Northern Lights. If that all sounds rather too action-packed, remember that relaxing in naturally heated pools is one of the staple elements of Icelandic life! In terms of Icelandic food, don’t be put off by tales of rotten shark meat, ram’s testicles, pickled whale blubber and raw puffin hearts… These are all traditional delicacies, but not on the day-to-day menu of most Icelanders! Unsurprisingly, you can expect to encounter lots of fresh seafood, as well as skyr (similar to strained yogurt), pylsur (hotdogs made with lamb), and cheese - Iceland produces around 100 different types. Finally, a word on safety: despite being among the world’s most active volcanic regions, Iceland is not generally considered a dangerous place to live. That goes for both natural and other types of threat – crime rates are relatively low.